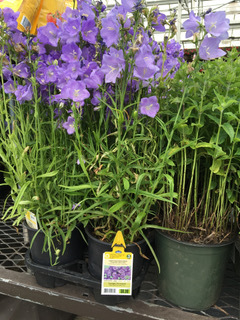 Janet Allen* wrote an interesting comment to my June 25, 2018 post on Darn Invasive Bellflowers! And she sent photos!! I thought everyone might be interested in reading what she had to say. “No solution, but a lot of sympathy! This was in our yard when we moved in about 35 years ago and it seemed rather benign at the time. Over the decades it has continued to spread and I have been increasingly alarmed. My husband made it a project this year and pulled a lot out, but the visible plant is just the tip of the iceberg. He totally removed all plants from an area and dug down to get the tuber supporting the whole mess. I’ve replanted there (with natives) but will never be able to move those plants elsewhere since I’m afraid there might be bits of root left. Someone on a recent yard tour said that her friend had given her some, mentioning that “it spreads”! I also saw C. persicifolia for sale at Home Depot – another invasive! As I see Creeping Bellflower this time of year growing in people’s gardens and being tended to so carefully, I’m more determined than ever to find a way to control it. 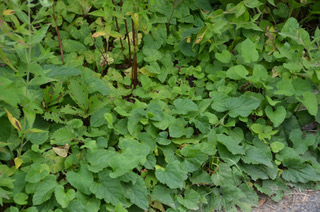 My other arch enemy is Goutweed (Aegopodium podgraria) which also seems to be part of many people’s landscapes. I’ll keep you posted. 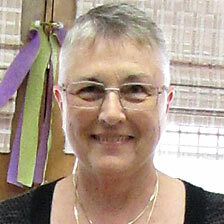 Janet Allen is president and co-founder of the Wild Ones chapter Habitat Gardening in Central New York (HGCNY). She is a past member of the Wild Ones Board of Directors. 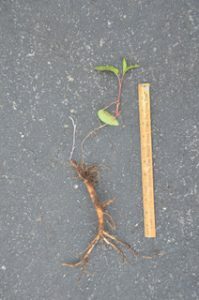 The “at least 6″ deep” part is important, noting the photo (above) of the ruler next to the plant and its root. 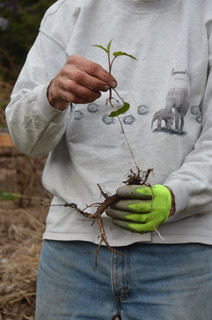 “Dig at least 6” deep to locate and remove all rhizomes and perennial roots. If all perennial tissue (roots and rhizomes) is removed, populations can be eliminated. Thanks for the added info, Janet. Six inches deep will take a lot of muscle and determination, and as your quote says “for several years.” Even sneaky garlic mustard doesn’t typically have a root that long.